Rockefeller Park stretches along the Hudson River just north of the World Financial Center, now called Brookfield Place with beautiful gardens, playgrounds, open fields and the Irish Hunger Memorial. There are interesting park buildings, waterfront scenes, koi ponds, ferry slips and lots of people to incorporate into our drawings. 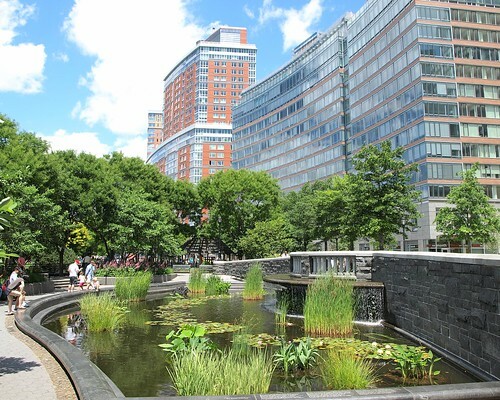 LOCATION: The Lilly Pond in Rockefeller Park at the end of Vessey Street between the the Irish Hunger Memorial and the Ferry Terminal. We can work there for a while and then move around the park for more views. TIME: 11:00 AM We will break for lunch about 12:30. Bring something along or buy something from the vendors at Hudson Eats, Shake Shack or any other restaurant in the complex. TRANSPORTATION: 2,3 Park Place; A, C Chambers St; E World Trade Center; N,R Cortland St. Walk to Vessey Street and walk towards the River. Walk to the end of the street and continue past the Irish Hunger Memorial to the Lilly Pond. Please RSVP to Raylie Dunkel directly at raylie@verizon.net.